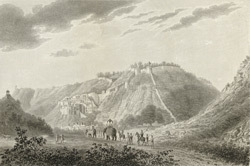 Engraving of the palace and fortress of Bundi by Edward Francis Finden (1791-1857) and Patrick Young Waugh (1788-1829). Plate 1 of the 'Annals and antiquities of Rajast'han or the Central and Western Rajpoot States of India' published in London in 1832. In 1818 Mewar and other princely states of Northern India signed a treaty with the British, and Colonel James Tod became the first Political Agent to the Western Rajput States. Along with his official duties, Tod became very interested in the genealogies of the Rajput Kingdoms as well as the art they produced. The capital of the state of Bundi in Rajasthan is a picturesque town situated in the valley of a steep hill. The town is dominated by the palace located mid-way up the hill and the Taragarh fort at the summit. The palace, with its pinnacled terraces, arched roofs and pavilions, was built in 1660 in the Rajput architectural style. The Taragarh Fort with its crenellated ramparts and high parapets dates to c. 1354 and is reached by a steep road leading up the hillside.